Let your special one know how your darling has turned your nights into sunny dawns with their vibrant presence. 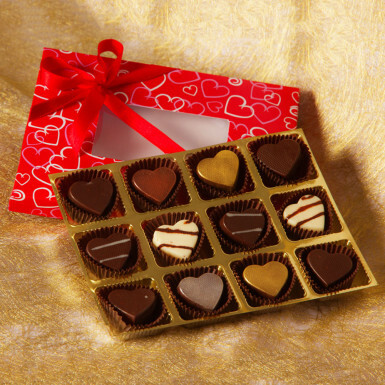 Send them amazing heart-shaped chocolates in a beautifully decorated packaging. Make your Valentine’s day happening with these exotic chocolates and put a smile on the face of your dear one. This mouth-watering heart shape chocolate comes in an elegant gift box. This heart shape of golden chocolates gives a classy look with divine taste. This cute gift box filled with 12 heart shape chocolates created from our special milk and bittersweet chocolate, flavors include mandarin surprise, almond, butterscotch, fruit n nut, nougat.